As the first notable snowfall signals that it's time to settle in for the winter, I'll pour a cup of hot cocoa and fill you in on our progress. Last winter, a heavy snow took out our make-shift wood shop and shelter for our kitchen firewood, so a key goal for this year was to get permanent structures built. While they're not finished, at least they're in place and some what functional. As weather permits, we'll keep improving them through the winter, but it's really nice to have so much covered work space at our disposal - way different from our first winter here on raw land when we had to pretty much just wait until the snow melted in order to be able to accomplish anything. The wood shop's walls are ten feet tall, a heighth that allows us to clad the outside with a full sheet of 8' tall press board, and still have a 2' high "sky light" section under the eves. That will let in enough daylight for general lighting; by only lighting the work areas actually in use, we can cut down on the amount of electricity used. Since we're committed to having this building be "grid neutral", it's important to keep an eye on every watt. [Grid neutral - Washignton is an "inter-tie" state, which means that we can connect to the grid and either send power to the grid when we have a surplus, or draw from the grid when we need to. When we push energy back onto the grid, the meter runs backwards lowering our power bill. Through a combination of using energy efficiently, and the generation of renewable energy, it's possible to end the year with a negative reading on the meter. 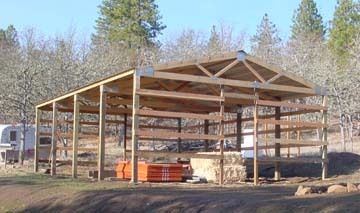 We also took the time to put up the horizontal framing on three sides of the event hall, choosing to leave the long, southern side open for the winter. The Plan is to pull the tractors in under the roof and get to work on some over-due maintenance on the brakes. Strictly speaking, brakes aren't necessary on tractors, but there are times when they really do come in handy - no doubt more than one farmer's last words were "Damn, I should've fixed that." While we're snowed in, we'll use the time to get more of our sustainable systems ready for spring - a good example of that is the new rabbit cages we had custom made for Vermadise. The heart of Vermadise lies in the six worm bins where our little red friends will oversee the conversion of wood materials into high-protein fish food and super-rich garden soil. A key step in the process involves the use of bacteria to breakdown the cellulose content of leaves, wood chips, old bedding, etc. Those things won't decompose on their own because they lack sufficient nitrogen for the bacteria that digests cellulose to grow. One way to supply the needed nitrogen is to raise rabbits over the beds - that way their urine and droppings will fire up the bacteria below. 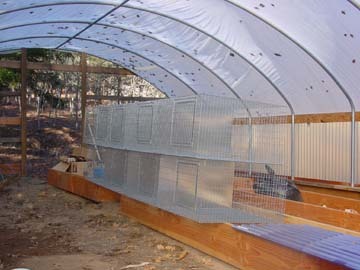 And so, we had the experts custom build us two sets of over-size rabbit pens. They're oversized in that we don't want the rabbits to undergo stress from being cramped in too small a cage, and oversized in the sense that the rabbit cages have been designed to fit over the 30" by 120" worm bins. While we could have divided the ten foot long cage into six compartments, we choose to provide the does with more room - so each cage is 30 inches by 30 inches. After a worm bin is emptied, and then refilled with used bedding, leaves, shredded paper and wood chips, a rabbit cage will be placed over the bin to fertilize it. By regularly moving the cages from bin to bin, we can insure that the manure gets where it needs to go, without having to mess with it. This is actually one of the key practices involved in sustainable agriculture - letting the animals put the manure where it needs to go instead of having to continually clean out stalls and pens. For example, that's why we winter the sheep in the garden. 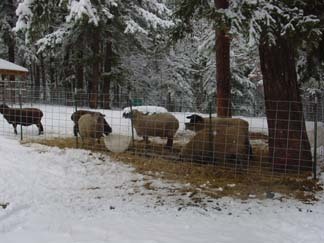 Once the crops are done, the sheep come in and spend the fall and winter working their manure into the ground. Then, come the spring, we rototill it up and we're ready to go, all without having to haul around a lot of muck. The new woodshed is a delight. There's a satisifed feeling that comes from seeing a shed full of dry, split firewood that just can't be found elsewhere. It's a pleasure based on anticipation of gathering around the woodstove on a cold, wintry morning - of hearing the tea kettle whistle and smelling the tang of smoke as it tempers the bite of the northern wind. There's just something primal about a fire, something that's deeply rooted in us, something that takes joy and comfort from the heat of the stove, the smell of pine sap and the ancient connection it evokes with ancestors who've gathered around the hearth for warmth since the dawn of civilization. Our special appreciation goes out to Jay, Liz, Todd, Kenneth, Brittany, Albert and Daniel. 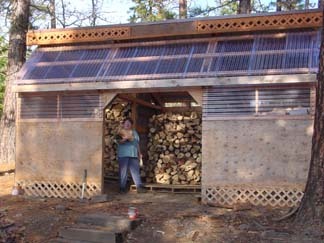 With their help, we were able to get the new woodshed well stocked with dry wood for this winter. The building is designed to hold three year's worth of wood for the kitchen stove; that way, there will always be a stash of well seasoned wood ready to burn. In the past, we've had to stop gathering firewood when the rains came because it's counter-productive to stack wet wood on dry. The new design allows us to load wet wood into one side of the shed, while preserving access to the dry wood stacked in the other side. 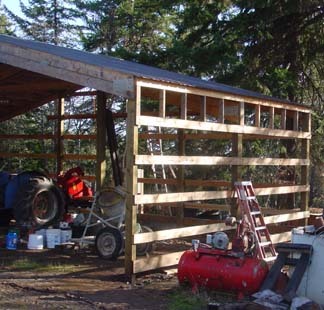 The woodshed's center bay is reserved for oak since it's helpful to keep the oak separate from the pine/fir wood that is our primary fuel source. When we're wanting to get a fire started, we use pine because it fires up quickly, but once there's a bed of coals in the stove, and assuming that the day's cold enough that we want a fire to linger through the afternoon, we switch to the slower-burning, more dense oak. By having the pine and oak stacked in different sections of the woodshed, we have ready access to whatever fuel is appropriate to the day's needs. This fall has been exceptionally dry as shown by the latest reports that find the snowpack to be only 28% of average. If January and February aren't chock full of snow, the cities are going to be hurting for water by next summer. Our new non-potable water system will give us access to additional water that we can use for the animals and the gardens, but there's not much that we can do about the heightened fire danger that comes with extended dry spells. But even in dry years, the snow eventually comes. We didn't have a White Christmas, but we've definitely got a white New Year. Although the first serious snowfall was only about six inches, it looks like it's the snow that will white the ground. As long as the ground is bare, the brown soil can absorb whatever sunlight comes its way, but once the ground is covered in snow, the white surface reflects any heat from the sun and locks us in to winter. Once we're snow covered, we'll stay that way until the March rains come and wash it away. 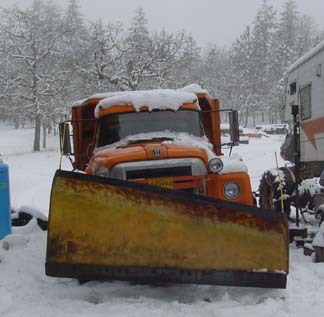 This year we have a new option to deploy in our annual dance with winter - a really serious snow plow - but each new tool has its own challenges. In this case, we're finding that the weight of the plow is making the back of the dump too light to get good traction. One option we're looking into is loading the back of the dump truck with 55 gallon plastic barrels filled with water. Each barrel adds about 500 pounds of weight, so we'll keep adding barrels until we get the traction we need. I'm also chagrined to find that the snow chains for the bus aren't where I remember them being stored, and now that there's six inches of snow on the ground, it's much harder to root them out of wherever they're hiding. Such are the lessons learned through experience. On the other hand, we're glad to report that Vermadise has weathered its first notable snow storm without undue incident. 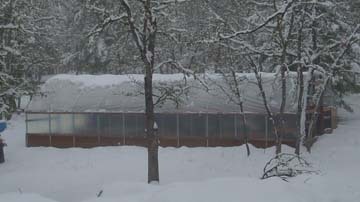 Over the years we've become pretty good at figuring out how much strain this style of greenhouse can take, and one way to insure that the building doesn't collapse under the weight of a wet snow is to use thinner plastic. A real greenhouse would commonly be covered with two passes of 6 mil plastic, but we learned early on that such a covering will support more snow weight than the metal frames can hold up. Commercial greenhouses can get away with that because they blow heated air between the two layers, thereby creating a warm space between the snow and the greenhouse, a space which melts the snow and lessens the load. Since we don't heat our greenhouse structures, we can't rely on that effect. Instead, we go with a lighter weight plastic with the intent that if the weight of the snow gets to be too much, then the plastic will fail before the metal arches give way. It's worked for us so far, but each new structure is different, and as a bit of extra insurance, we're going to install some cross cables to strengthen the frame during the winter months. They restrict free movement a bit during the 90 days we're subject to getting heavy, wet snows, but once the danger's past, they can be removed and stored away until for next winter. The point of our greenhouse design isn't to be able to produce tomatos year round, but rather to increase our production by allowing us to get plants started earlier, and keep them producing later than they would if they were outside on their own. That may not sound like much, but by adding six weeks on each end of the growing season, we're able to increase our growing season by 50%. And, since much of the growing season is needed to grow the plant itself, the extra time allows for almost double the actual food production. Well, that pretty much brings you up to date. The next couple of months will involve indoor work on the dining hall, maintenance on equipment and generally taking time to get tools and materials organized in preparation for next year. And getting caught up on reading, which is one reason why this is my favorite time of year. The woods are quiet, the wood stove is hot and there are good books to read - it doesn't get much better than that.